This is the first scholarly work to examine the cultural significance of the "talking book" since the invention of the phonograph in 1877, the earliest machine to enable the reproduction of the human voice. Recent advances in sound technology make this an opportune moment to reflect on the evolution of our reading practices since this remarkable invention. Some questions addressed by the collection include: How does auditory literature adapt printed texts? What skills in close listening are necessary for its reception? What are the social consequences of new listening technologies? In sum, the essays gathered together by this collection explore the extent to which the audiobook enables us not just to hear literature but to hear it in new ways. Bringing together a set of reflections on the enrichments and impoverishments of the reading experience brought about by developments in sound technology, this collection spans the earliest adaptations of printed texts into sound by Charles Dickens, Thomas Hardy, and other novelists from the late nineteenth century to recordings by contemporary figures such as Toni Morrison and Barack Obama at the turn of the twenty-first century. As the voices gathered here suggest, it is time to give a hearing to one of the most talked about new media of the past century. 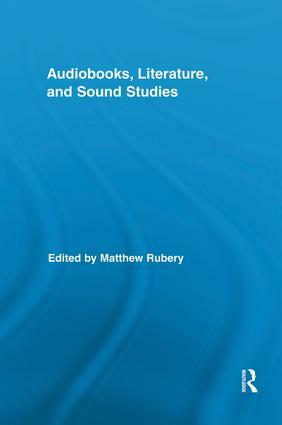 Matthew Rubery is Lecturer in Nineteenth-Century Literature at Queen Mary, University of London. He is the author of The Novelty of Newspapers: Victorian Fiction after the Invention of the News (Oxford, 2009), which won the European Society for the Study of English (ESSE) First Book Award 2010. His article "Play It Again, Sam Weller: New Digital Audiobooks and Old Ways of Reading" appeared in the Journal of Victorian Culture in 2008. Cultural and media studies are now well-established as important academic disciplines and are inspiring new research into a wide range of pertinent issues. This series presents outstanding research in these subjects, helping to shape the direction of future inquiry.